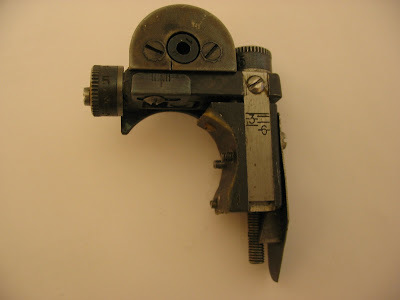 Above is a norwegian Hauges Diopter sight, produced in the 1950s. 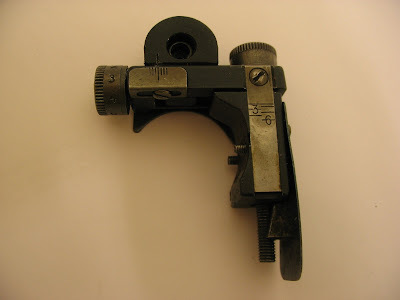 According to some sources I´ve seen, these sights were considered as being the best diopter design available for these rifles. The reason for this is that the top part of the Hauges can be removed without having to use tools at all. The flat spring on the right can be pulled out to disengage the long elevation screw, then the top can be lifted off. The Hauges is installed with screwes through the reciever side, just like a Lyman or Busk design. In the pic above is an earlier variant, looking a bit different than the later version below. In general, the early ones had more milled parts and the late ones made more use of castings. The Hauges required removal of some stock wood at the side of the reciever, and the drilling and tapping of two holes. As with all diopter sights this MUST be done by a skilled gunsmith.